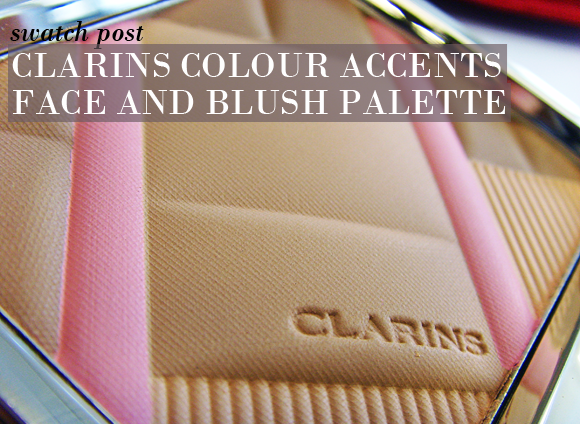 Get an instant radiance boost with the limited edition Clarins Colour Accents Face and Blush Palette, the star product of the soon-to-be-launched Clarins autumn make-up collection. Every season Clarins creates one beautiful palette, and this time the bold and feminine geometric design of Colour Accents takes centre stage. Four complimentary shades are infused with a light-optimising+ complex to reduce the appearance of wrinkles and imperfections, while providing an instant radiance boost. Contour, shade and add colour in one simple step! 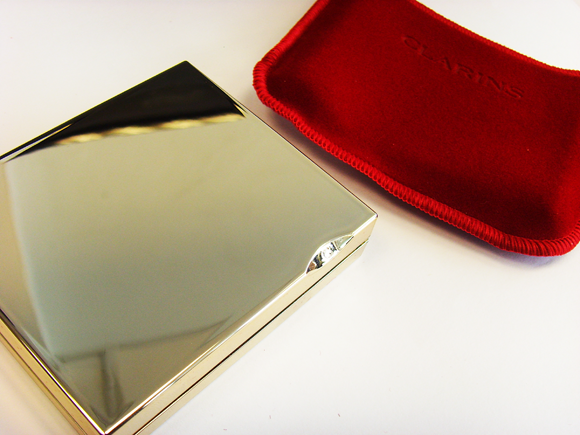 The pressed powder is packaged in the signature pale gold Clarins compact, with its sleek lines and embossed ‘C’. The fairly weighty compact is wrapped up in plush red velvet to protect it from swatches and fingerprints. Open up the compact to reveal four harmonious shades of powder in an embossed geometric design. There is zero shimmer – instead, the finish is more of a satin matte. This is ideal for those who struggle with shine yet still want the skin to appear natural. 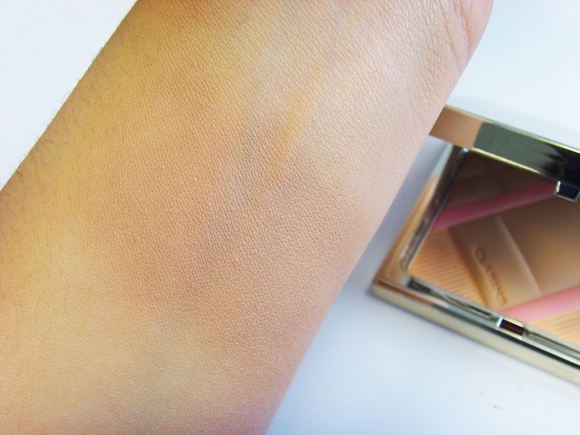 The powder is infused with the same fresh scent of Skin Illusion which makes it such a joy to apply. Three of the colours, which range from a creamy beige to a bronzed beige, are designed to even and brighten the complexion. The fourth, a playful candy pink, is perfect as a blush. When swirled together with a big face brush it provides a flawless all-over finish. The above is swatched heavily to give you an idea of the colour, but a light dusting will provide a more natural-looking translucent result. 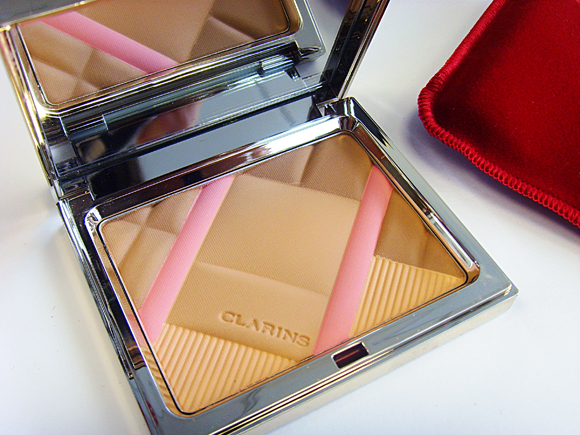 Clarins says that the powder is ideal for all skin tones, and this is mostly true. Very dark or very pale skinned ladies may struggle to make it work with their skin tones; otherwise I predict that this powder is going to be a big crowd-pleaser. I love multipurpose products, so this one had to be mine, and since it is a Limited Edition, so what is there to think? This product comes in a gold, nicely not high quality package, and it weights 10 grams. Under the cap you can find face powder in a 3 colors with pink stripes of a blush.Smell of this product is very nice, an old smell of a rose, a violet and iris. If you know how the Violetta di Parma perfume smells, this powder smells very similar to it. I was a bit sceptical about applying this blush on my cheeks, and was very surprised when I actually applied it with a brush. It is possible! :) This blush gives a very nice, natural pinkish color to your cheeks, while the other three colors of a face powder can be used all together or separate for contouring. I swiped my brush over the palette and then apply it all over the face, at first my face looked a bit light, but after a few minutes when powder sets on your face and adapt to it, it gives you a nice finish. I was very pleased with effect on my face. I used darker parts of this palette for contouring my cheeks, and on the top of that I add a bit of a pink blush. It doesn't clog my pores, and it kept my face mate for about 6 hours. I really love it! Great product for great price! 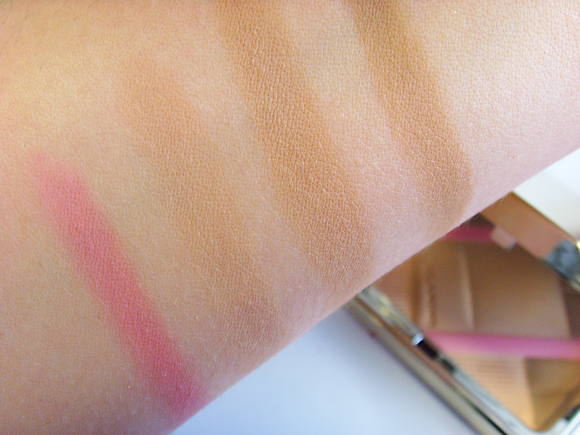 This entry was posted on Wednesday, August 1st, 2012 at 1:00 pm and is filed under Make-up, New products, Swatches, Tried & Tested. You can follow any responses to this entry through the RSS 2.0 feed. You can skip to the end and leave a response. Pinging is currently not allowed.